This website is dedicated to political demography, and to The Age-structural Theory of State Behavior (download article here). Read "The 8 Rules" for a quick summary of the theory. See sidebar (homepage) for key publications and web essays. Follow on Twitter at @rpCincotta or visit the New Security Beat. The PowerPoint slides for my guest lecture in Prof. Shlomi Dinar’s class in FIU’s Masters of Arts in Global Affairs Program are posted here. 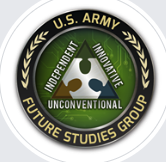 Please browse this website for more information on the age-structural theory of state behavior and visit my pages on the New Security Beat blog for short essays which employ this theory. A brief article (blog) that sums up the findings is: “The Eight Rules of Political Demography” (July 2017). At the following links, please find the PowerPoint slides presented and the handout provided at the AFSG lecture session on March 7, 2019. Thanks for the invite, AFSG. Your questions were excellent–probably the most perceptive set I’ve ever fielded (or tried to field). If you would like to look at some of the theory/applied studies, please cruise through the menus on this website, and read a few of the short essays on political demography (2-3 pagers) on the Wilson Center’s New Security Beat. 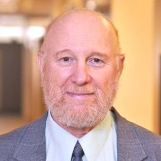 The PowerPoint slides that were presented in my lecture in Prof. Jack Goldstone’s GOVT444 class at GMU on Feb. 27, 2019 (James Buchanan Bldg., noon) are posted here. If you attended the class, thank you for your attention and questions. If, by any chance, you would like to know more about the predictions of the age-structural theory, continue reading the posts on this site and the essays organized by the menu. 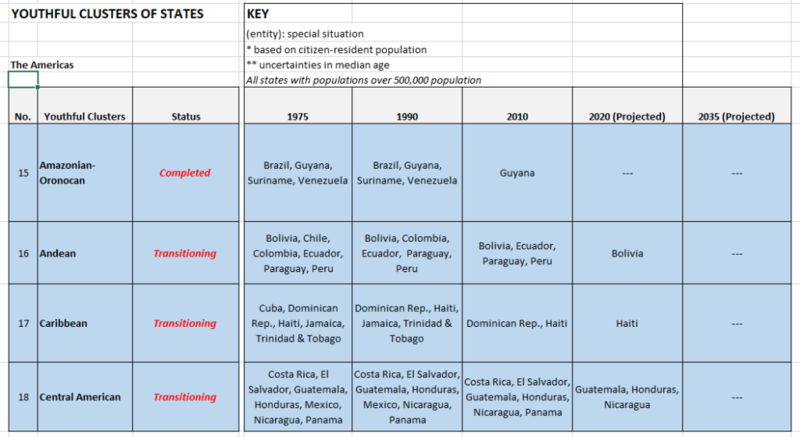 In addition, see the latest posts on political demography on the New Security Beat. They’re quick reading. 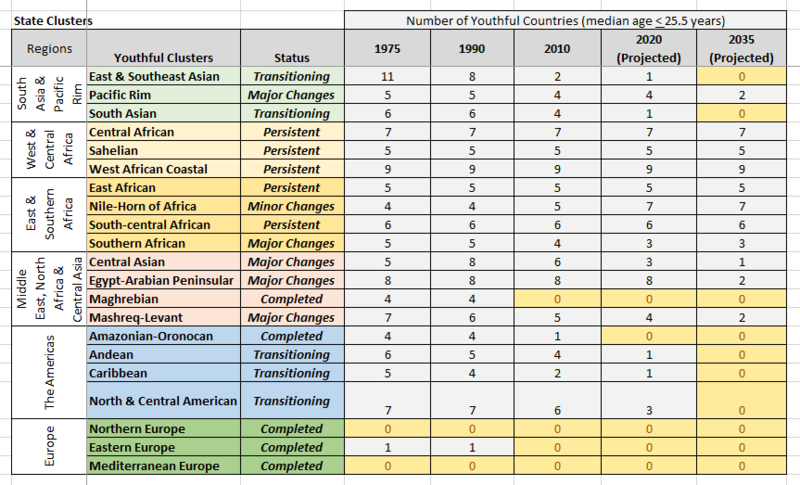 Is demographic change the key to development? 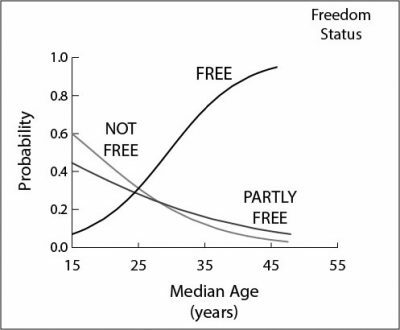 [Graph on left] The statistical method used to produce the age-structural timelines (logistic regression) shown here, works with categorical data, rather than individual data points. 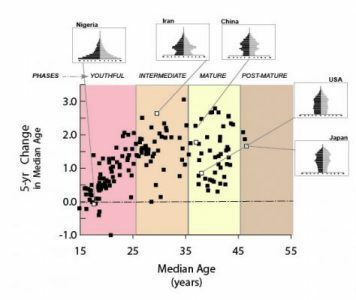 So, to show the pace of development on age-structural timelines, each of the three basic transitions—child survival, educational attainment, and income—are divided into a series of consecutive categories. 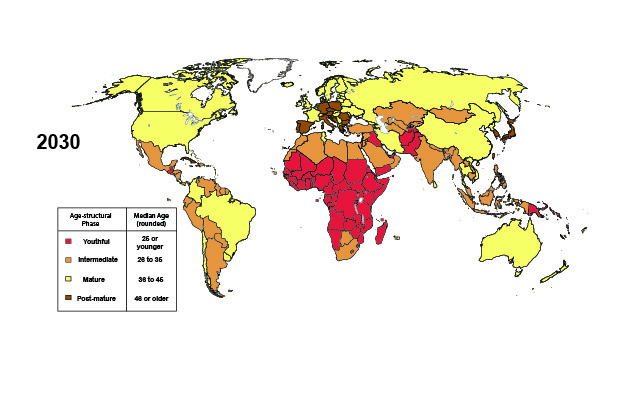 For example, the income transition (c., bottom graph) is represented by the World Bank’s low, lower-medium, upper-medium, and high-income categories. Similarly, the child survival transition (a.) 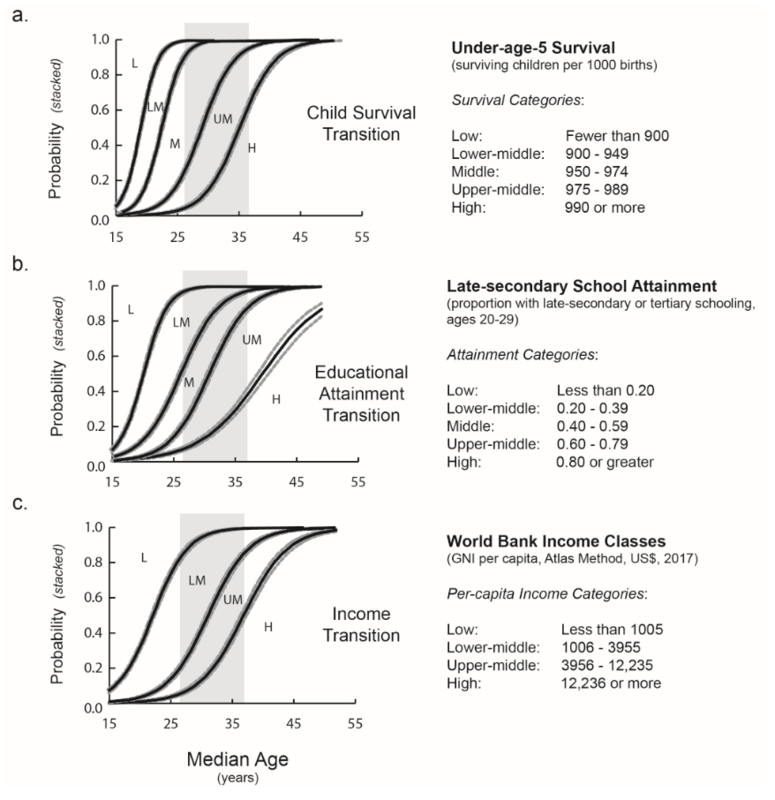 is divided into five survival categories, and the educational attainment transition (b.) into five attainment categories. Unlike historic timelines, each age-structural timeline is spanned by a series of curves. 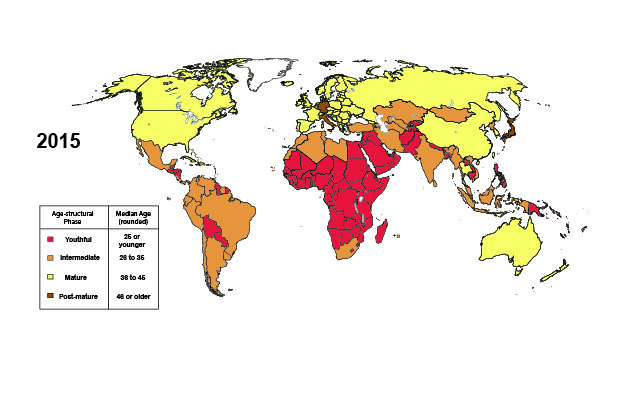 Each curve shows when—in terms of median age—countries are likely to achieve that category. 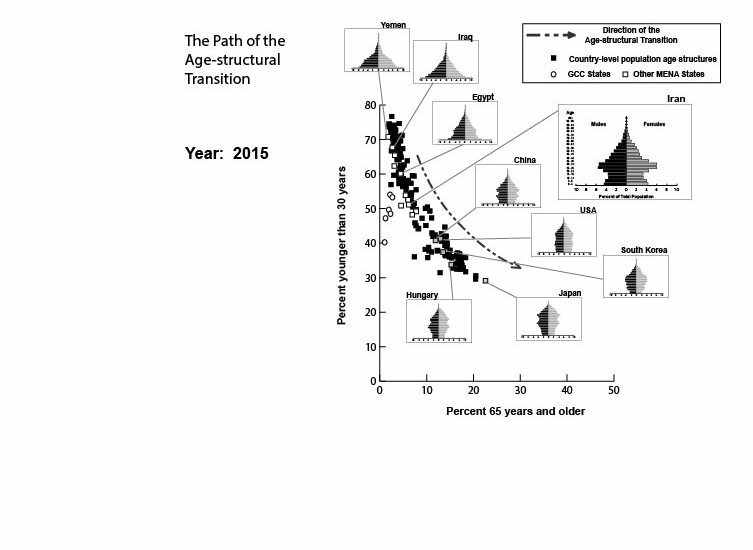 The next curve (to the right in the series) shows how rapidly, in terms of progress in median age, countries are likely to move into the next higher category.